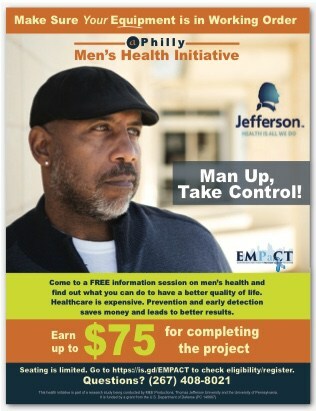 Developed educational materials and conducted community-based recruitment for Thomas Jefferson University’s pilot study to reduce prostate cancer among Black men. MEE is providing the team with additional capacity in qualitative audience research; development of branding components, culturally specific participant recruitment, and prostate health education materials; grassroots community outreach and mobilization; and audiovisual/social media production. The project is funded by the U.S. Department of Defense through its Prostate Cancer Research Program. MEE leveraged its two decades of health communications research and expertise in low-income and underserved communities, relying on the medical experts to ensure accuracy and consistency of the educational information. The study focuses on Philadelphia neighborhoods with high incidences of prostate cancer among African American men. One of MEE’s major roles was to create culturally relevant study recruiting materials and to develop and adapt the various health message concepts and educational content (including videos) for the study’s control and treatment groups. As a foundation for message development, MEE conducted four focus groups with African American men in the targeted age range and demographic profile. Based on data from the focus group, MEE developed recruitment and education materials. MEE is supporting the project with community-engagement tasks, identifying and engaging community-based organizations, faith-based institutions and local small businesses in each target community in Philadelphia. We have introduced the upcoming study to key stakeholders in each community, via MEE’s Chat & Chew small-group information sessions, to get their buy-in, along with referrals of good sources to recruit study participants. Work will continue through 2018.